We continue our series on the US at the World Cup with a look at why the US failed to qualify for the tournament between 1950 and 1990. The US shocked the soccer world when it defeated England at the 1950 World Cup. Yet for forty years after that famous victory — that’s nine consecutive World Cups — the US would not make it out of the qualifying rounds. In fact, the US wouldn’t win another World Cup game until it defeated Colombia at the 1994 World Cup, and that victory began with a Colombian own-goal. In the nine unsuccessful qualification campaigns between the 1950 and 1990 World Cups, the US compiled 11-19-9 record, being outscored 51 goals to 78. 1954 World Cup qualifiers: With only one North American berth in the 1954 World Cup, the US qualification campaign is dead in the water right from the start with 4-0 and 3-1 losses to Mexico in Mexico City. The US defeats Haiti 3-2 and 3-0 in the remaining qualifiers in Port-au-Prince. Philadelphia’s Walt Bahr plays in each of the qualifiers with Bennie McLaughlin also playing in the games in Haiti. 1958 World Cup qualifiers: The US loses 6-0 to Mexico in the first qualifying match. In the return game in Long Beach, California, the first against Mexico to be held in the US, the team loses 7-2. Bahr plays in both matches. Still, with a slim chance of qualifying, the US Open Cup and National Amateur Cup winners, St. Louis Kutis, are chosen to play Canada rather than a picked team. They lose 5-1 and 3-2. 1962 World Cup qualifiers: The US rallies from a 3-0 deficit to draw 3-3 with Mexico at Wrigley Field in Los Angeles. In the return leg in Mexico City, the US lose 3-0. Future National Soccer Hall of Famer Alex Ely of the Philadelphia Ukrainian Nationals wins his first US cap in the 3-0 loss. 1966 World Cup qualifiers: Before the US plays Mexico in its first qualifying match, Mexico has already defeated Honduras twice. The US comes from behind to lead 2-1 at Memorial Coliseum in Los Angeles before Mexico equalizes from a penalty kick in the closing minutes after the US goalkeeper kicks the ball at a Mexican player and the game ends as a 2-2 draw. The US then lose 2-0 to Mexico away. With Mexico thus in first place in the qualifying group, the US plays two meaningless matches against Honduras away, winning the first game, 1-0, and drawing the second, 1-1. In Honduras, the US team has to find its own transportation (including a painter’s truck) from the airport to their hotel. They also have to find their own transport from the hotel to the stadiums, where no dressing room facilities are provided. Alex Ely plays in both games against Mexico. Philadelphia soccer legend Walt Chyzowych plays in both games in Honduras. Chyzowych had been in the starting lineup for the game against Mexico in Los Angeles but was scratched from the lineup for violating curfew. Tony Cirino writes in U.S. Soccer vs. the World, “[T]he center forward had been seen in a hotel room with a woman. Later the U.S. officials found out Chyzowych had been helping his wife get settled in a separate room.” Future Philadelphia Spartan Andy Cziotka earns his only US caps playing in all four qualifiers. 1970 World Cup qualifiers: With Mexico having an automatic qualifying spot as the host nation, the US does not have to face their nemesis to qualify for the first time since they beat them in the 1934 qualification match in Rome. The US loses 4-2 away to Canada but manages a 1-0 victory at home with former Philadelphia Spartan Dietrich Albrecht, who plays in each of the qualifiers in the US campaign, scoring the lone goal. The US then comes up with a big 6-2 victory over little Bermuda followed by a second victory by the score of 2-0. After a seven month break during which the coach, Phil Woosnam, leaves the team to become director of a struggling NASL, the US can advance to a playoff against the winner of the matches between El Salvador and Honduras (which would spark the Soccer War on 1970) if they can beat Haiti. They lose 2-0 away and 1-0 at home. 1974 World Cup qualifiers: The US comes back from being down 3-0 to lose 3-2 in the first match against Canada. It is the first of 16 caps for Philadelphia-born Barry Barto, who would play with the Philadelphia Atoms in the team’s four years of existence and later coach at Philadelphia Textile. The US manages a 2-2 draw in the return match at home but then lose 3-1 to Mexico away and 2-1 at home. 1978 World Cup qualifiers: Coached by Walt Chyzowych, the US begins its qualifying campaign with a 1-1 draw away against Canada followed by a 0-0 draw against Mexico in Los Angeles. The US then loses 3-0 to Mexico away and defeats Canada 2-0 at home. With CONCACAF changing the qualification format for this World Cup so that two North American teams will advance to the next qualification round, the US faces Canada in a tie-breaker on neutral ground in Haiti. The US loses 3-0. Appearing for the US in every game except for the 0-0 draw against Mexico is Trenton-born Bobby Smith, who played in Philadelphia for the Atoms, Fury, and Fever, as well as the New York Cosmos, San Diego Sockers, and Montreal Manic. Appearing in each of the qualifiers for the US is future Philadelphia Fever player Fred Grgurev. 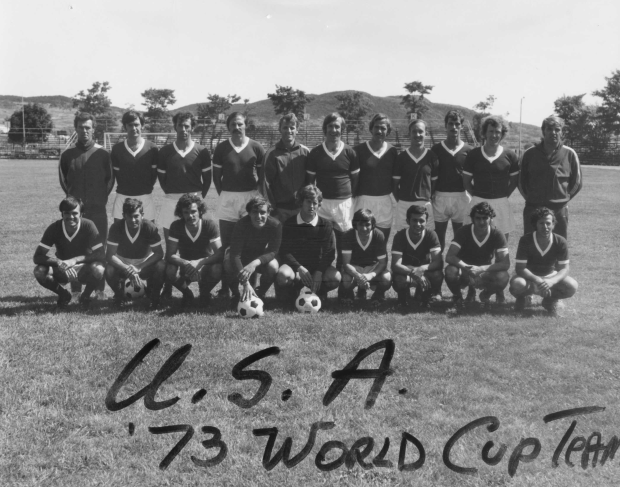 1982 World Cup qualifiers: With the same qualification format as the 1978 World Cup, the US, who are again coached by Walt Chyzowych, will advance to the next round if it can finish in second place in its games against Mexico and Canada. The US first has a scoreless draw against Canada at home before losing away 2-1. The US then loses 5-1 to Mexico. To qualify, the US would now need Canada to win in Mexico and to also beat Mexico themselves in their return leg match in Florida. It was not to be. Canada tied Mexico and the US was left with the consolation of a 2-1 victory, its first full international win against Mexico since 1934. The team’s performance in this campaign is not helped by the divisiveness within the squad over the NASL players’ strike. 1986 World Cup qualifiers: With Mexico once more hosting the World Cup thanks to Colombia’s withdrawal, the US again doesn’t have to face Mexico for qualification. They begin their campaign with a 0-0 draw against Netherlands Antilles, defeating them 4-0 in the return leg at home. The US then defeats Trinidad & Tobago 2-1 and 1-0. Against Costa Rica away, the US are pleased with a 1-1 result and need only a tie at home to win their group. They lose 1-0. 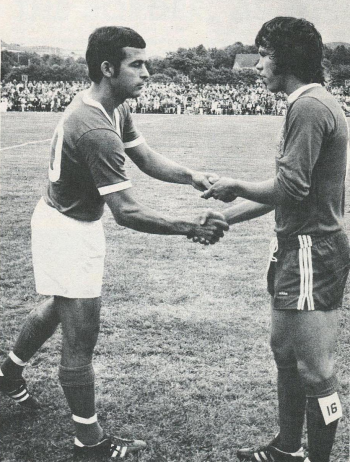 On the pitch, the US faced two consistently better opponents for much of its forty-year drought of World Cup appearances, one of which is a continuing challenge to this day, the other just as the federation and the team were beginning to resemble something like a professional international soccer organizations and address longstanding problems, much as existed already throughout Europe and South America. When the US and Mexico faced one another in a qualification match in Rome before the World Cup in 1934, the US was the more developed soccer nation and easily won 4-2. As Roger Allaway and Colin Jose write in The United States Tackles the World Cup, “It is easy to overestimate the significance of this victory. Mexico was not yet the strong team that it was later to become. This was only the ninth full international game it had ever played.” Of course, including friendlies, Olympic games, and its three games in the first World Cup, the US itself had only played 15 international games since the founding of the US Soccer Federation in 1913. With a comparatively small number of participating countries following the devastation of the Second World War, the US qualified for the 1950 World Cup despite losing to Mexico 6-0 and 6-2 in the 1949 North American Football Confederation Championship. It wasn’t until the qualification games for the 1958 World Cup that the US actually played Mexico in the US for the first time, and it wasn’t until the qualifiers for the 1982 World Cup that the US managed to beat Mexico in a meaningful match for the first time since the 1934 game in Rome. During the period between the 1950 and 1990 World Cups, the US managed a 1-10-3 record against Mexico, being outscored 13 goals to 44. If the US had had to play against Mexico for the 1970 and 1986 World Cup qualifiers, for which Mexico automatically qualified as host country, that record would have been even worse. In the qualifiers for the 1958, 1970, 1974, 1978 and 1982 World Cups, losses or draws to Canada were all factors in the US being eliminated. For much of its early history, the federation was a weak organization that had to battle to enforce its own or FIFA regulations, by the American Soccer Wars of the late 1920s. Some of this weakness was due to the fact that the federation was chronically short of money. The shortage of money also meant that there were little resources for national team players to train together for meaningful periods of time before competitions. For far too long the federation was also myopic in its vision, tied as it was to the soccer establishment of the Northeast of the US, which was largely Euro-centric. This would lead to a disconnect between the federation and the growing talent pool of the Latino immigrant population of the US, a situation the federation would not begin to address until the 1990s. 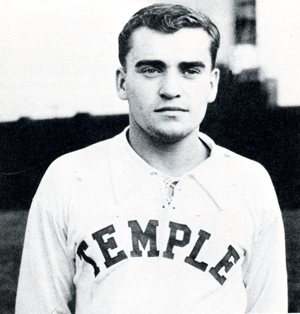 Walt Chyzowych when he played at Temple. The lack of money also affected the selection process: from its founding in 1913 through the 1950s, teams were made up of players from the East Coast and Midwest on the basis of geographical convenience — funds were simply not available to pay for the travel and living expenses of players from the West Coast. When money was not immediately available for participation in international tournaments such as the Olympics and the World Cup, federation officers often had to donate their own money or had to strong arm federation members into making donations. The lack of money led to absurdly poor team preparation before the beginning of qualification campaigns. Consider, for example, the qualifications for the 1954 World Cup. Because Mexico rightly insisted that the US comply with FIFA regulations stipulating that only native-born or naturalized citizens were eligible to be selected for a national team, the US roster was not finalized until just days before the team left for the games. While the Mexico team had been training together for weeks the US team had only two days for training before meeting their opponents in front of 60,000 spectators in Mexico City. Unsurprisingly, the US promptly lost 4-0. This would also be the case in the first qualification game against Mexico for the 1958 World Cup where the US lost 6-0 in Mexico and 7-2 two weeks later in Long Beach. It was not until the qualifications for the 1966 World Cup that the national squad was scheduled time to prepare as a team: twelve days of training in Bermuda with four warm-up games. The poor preparation of the US team was itself connected to a revolving door of part-time national team coaches. 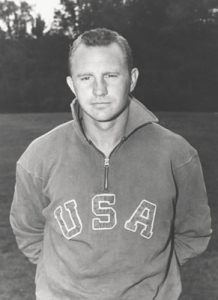 When the federation appointed Walt Chyzowych before the 1978 World Cup qualifications, he was only the second full-time coach in the history of the federation. The popularity of the Olympics was itself a problem. During the long drought of US appearances at the World Cup, it was simply easier for the federation to raise funds for the Olympics, a tournament every American sports fan had heard of, than to raise money for the World Cup, a tournament likely to be known at the time only to fans of soccer. This was even more true after the Second World War when the Olympics became a place for the East and West to fight the propaganda battle that was so much of the Cold War. The U.S. Soccer Football Association, though not particularly active in promoting the game, kept an eye on the calendar and never missed important dates. While it left the “professional” team [e.g. the World Cup team] to ASL interests, the federation took the Olympic team seriously, as it had in the past. The Olympics had a bigger national response in the press and was considered the official federation function. In addition, it was easier for a national Olympic committee to raise money, not to mention receipts from the gate. While the federation focused on the higher profile Olympic Games, it left the World Cup to the attention of the ever-shifting owners of the American Soccer League, which was itself more accurately called a semi-pro league than a fully professional league. In doing so, the federation not only failed to prioritize the single most important soccer tournament in the world, it failed to connect the development of a fully professional league with the development of the game itself in the US. While the federation would begin to direct more support to qualifying starting with the 1966 World Cup, it would take the appearance of the NASL to widen support for soccer in the US. Even then, with few exceptions like the 1973 Philadelphia Atoms, the emphasis was on attracting international stars, most of whom were at the end of their professional careers abroad, rather than developing US players. So, what was the result of the federation focusing on the Olympics? At the 1952 games in Helsinki, the US was out after one game, an 8-0 drubbing from Italy. In Melbourne in 1956, it was another one-and-done appearance, this time courtesy of a 9-1 defeat to Yugoslavia. Beginning with the 1960 Olympics in Rome, the US had to qualify for the first time to participate in the Olympic soccer tournament. After a 2-0 defeat, and 1-1 draw, with Mexico, the US Olympic hopes for that year were done. The US failed to qualify again for the 1964 Tokyo Games, bookending a 4-2 win over Panama with a 1-0 loss to Surinam and a 2-1 loss to Mexico. For the 1968 Games in Mexico, Bermuda ended the qualification hopes of the US. 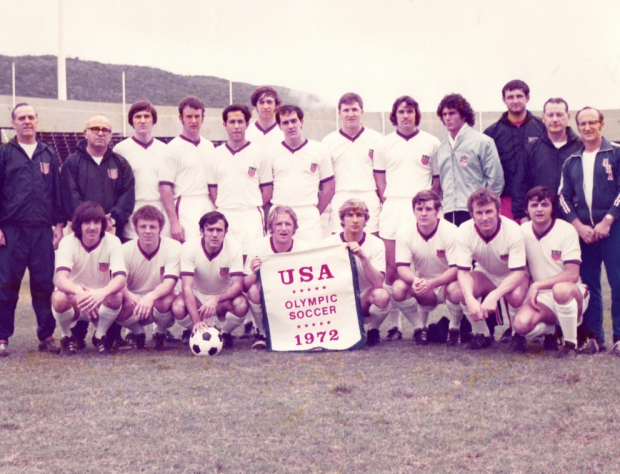 The US team, which included Casey Bahr, son of Walt Bahr, finally made it to the Games in 1972 after a qualification tournament that included a 1-1 draw against Mexico in Guadalajara and a 2-2 draw in San Francisco. Carrying a 6-1-6 qualification record into the Munich Games, the US began with a scoreless draw against Morocco before losing 3-0 to Malaysia and 7-0 to West Germany. For the 1976 Games in Montreal, the US couldn’t get past Bermuda and Mexico — falling 4-2 to Mexico in the final qualification game, which took place in Wilmington Del., on August 28, 1975. A 4-3-1 record in the qualification tournament for the 1980 Olympics in Moscow ensured a return to the Olympic tournament only for the US to boycott the Games after the Soviet invasion of Afghanistan. As host of the 1984 Summer Olympics, the US automatically qualified. Beginning with a 3-0 win over Costa Rica, the US then lost 1-0 to Italy and drew 1-1 with Egypt. It was a respectable performance, but not enough to advance to the quarterfinals of the Olympic tournament. The US again appeared in the 1988 Summer Olympics in Seoul after a 6-1-0 record in qualification. The team played Argentina to a 1-1 draw, followed by a 0-0 draw against South Korea, before being defeated by the USSR, the eventual gold medalist. Compared to the nine straight World Cups the US missed between its 1950 World Cup appearance and its reappearance 40 years later at the 1990 World Cup, appearing in five of the ten Olympic tournaments that took place between the same time period beginning with 1952 Games and ending with 1988 — six if we include the boycotted Moscow Olympics for which the US qualified — was quite an achievement. Still, the US never made it out of the group stage. The slow sharpening of the federation’s efforts to lay the organizational foundation necessary to field a team capable of qualifying for the World Cup that began with preparations for the 1970 World Cup qualifiers would be reflected in the improving performance of the team beginning with its qualification for the 1980 Olympic Games, eventually culminating in qualification for the 1990 World Cup tournament. And while valuable experience would be gained — be it institutional or in the exposure of coaches and players to developing technical and tactical trends in the world’s game — a simple fact remains: Olympic competition is not on the same level as World Cup competition. Several professional leagues existed in the US before the first season of the NASL in 1968. But these leagues were at best semi-professional and players did not make their living from the game. No matter how gifted US players may have been they were simply no match for truly professional players playing in leagues that were the height of professional team sports their home countries. This had been the case at the 1934 and 1950 World Cups and it would also be the case in qualifiers against Mexico through the 1950s and 1960s, then emerging as the soccer powerhouse of North America. Though never as successful as its first incarnation in the 1920s, the long-established semi-professional American Soccer League (ASL) provided a competitive environment for the development of the country’s best soccer players, even if the names of many of the league’s teams reflected the ethnic marginalization of soccer from the mainstream of American sport. Though the NASL got off to a rocky start, it soon eclipsed the ASL and by the late 1970s was proving to be a surprising success. But its success was based upon a dependence on foreign players and, with the exception of teams like the St. Louis Stars and the Philadelphia Atoms, teams located in cities that had a long tradition of developing top US talent, native-born players often had difficulty finding playing time. The NASL and the federation attempted to address this problem with the formation of Team America in 1983. 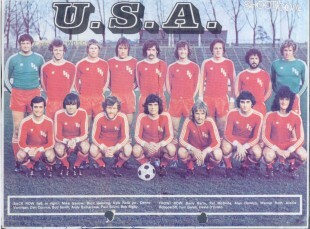 Based in Washington D.C., Team America was intended to be a professional version of the national team. Instead, it proved to be a complete flop. With several US national team players refusing to leave their existing club teams, and the Major Indoor League Soccer (MISL) refusing to allow its players to join an NASL team, the roster had to be filled out with foreign players. Team America got off to a 8-5 start before losing fifteen of its last seventeen games. At the end of its first season, the owner, Robert Lifton, pulled the plug on the team. 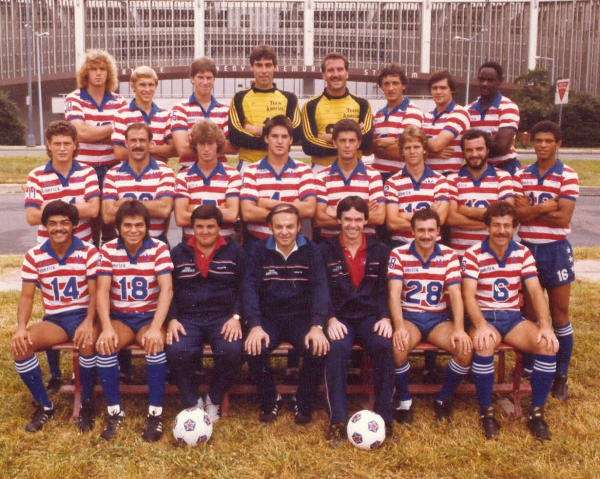 When the NASL folded in 1984, that left indoor soccer as the top flight of professional soccer in the US ahead of qualifications for the 1986 World Cup. With the demise of the NASL, the MISL in financial trouble, and the US hosting of its first World Cup soon to be a reality, the federation realized it was time to get its act together. In August of 1988, the federation announced it would offer full-time contracts for national team players so that they could make a living playing the game. When the US began its qualifying campaign for the 1990 World Cup, only one player was not under contract to the USSF. When Paul Caligiuri scored the goal for the US in its 1-0 victory over Costa Rica on April 16, 1989 at the National Stadium in San Jose, Costa Rica, the US would be back in the World Cup for the first time in forty years. A version of this article was first published on May 5, 2010. Those red and white hooped jerseys were sweet. They should think about bringing them back. Oh my goodness!Alketas Panagoulias was the coach of 1983 teeam? Great read, Ed. Thanks for pulling this together. It’s easy to forget how far we’ve come as a soccer nation. That was only 24 years ago. We have definitely come so far. Yeah, it’s nice to be able to take in the whole scope of this in one read, and also the reasons behind it. It is also heartening, in that we have now qualified for the last three and this one- and we have a professional league that is healthy and growing. Go USA, get revenge on Argentina for the 1930s fouls! A good summary of historical information, and analytically persuasive. I’d add that the persistent situation of the federation’s being strapped for cash had another effect. Even when the U.S. started playing •some• of its qualifiers against Mexico in the U.S., the federation didn’t try scheduling those matches in some venue remote from large concentrations of immigrant population — as we do now, by playing our Hex home matches against Mexico in Columbus. Instead, they played them in places like Long Beach and Los Angeles, because for the federation it was most important to get the money from a big gate — never mind that the healthy attendance came from a large Mexican immigrant community that would flock to the games and root fervently for the visitors. Accordingly, even though it was technically a home-and-away qualification series, the U.S. national team was never getting the benefit of a •real• home match, with an enthusiastically supportive crowd at their backs! That should refer to the •1986• World Cup qualifiers. 1988, of course, was not a World Cup year. In a conversation my son and I had with Walter Bahr just before the last World Cup, he mentioned that during in the September 1949 WC qualifiers in Mexico City, the federation gave the players a $5 per diem. That was really great, he said; in •those• days in Mexico, they could get their hair cut and their shoes shined for 25¢, and then dine like a king on the remainder! Coach Bahr noted with some chagrin that the federation didn’t make •that• mistake again. In Brazil for the Cup in 1950, for example, he reports that the players would just order what the wanted from the menu in the hotel dining room, and the charge would be put on the federation’s tab for the hotel. They were looked after just fine, but they didn’t get any spare cash that they might enjoy too much!